Plan your getaway to Sea Duction, this enticing home centrally located on the oceanfront in Rodanthe. With fantastic ocean views on every level and a distant sound view from the top level, as well as TVs in each bedroom, Sea Duction will provide a feast for your eyes and rest and relaxation for your mind. A playpen, high chair, baby gate, and booster seat are sure to make baby's vacation smooth sailing as well. Dry entry on the ground level and an elevator to all levels makes your stay a cinch from the time you arrive throughout your entire stay. Fun and games await in the game room with deck access on the first living level. Enjoy friendly competition at the pool table while you catch the big game on the TV. A wet bar with refrigerator and microwave will keep your treats close at hand. 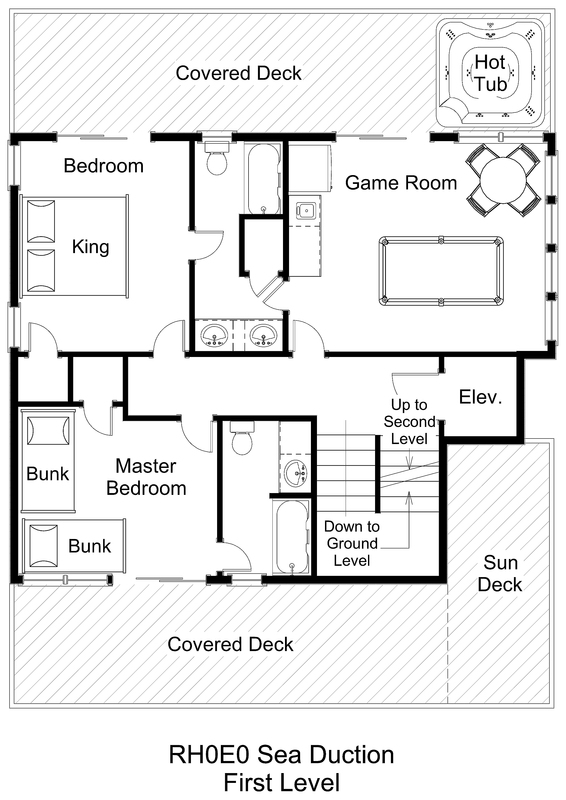 A comfortable king bedroom with deck access shares a full bathroom with the game room. Across the hall, a bedroom with two bunk sets features a shower stall in the private bathroom and a private shaded deck overlooking the pool area. Relax in the soothing hot tub on the shaded oceanfront deck while you listen to the music of the ocean. 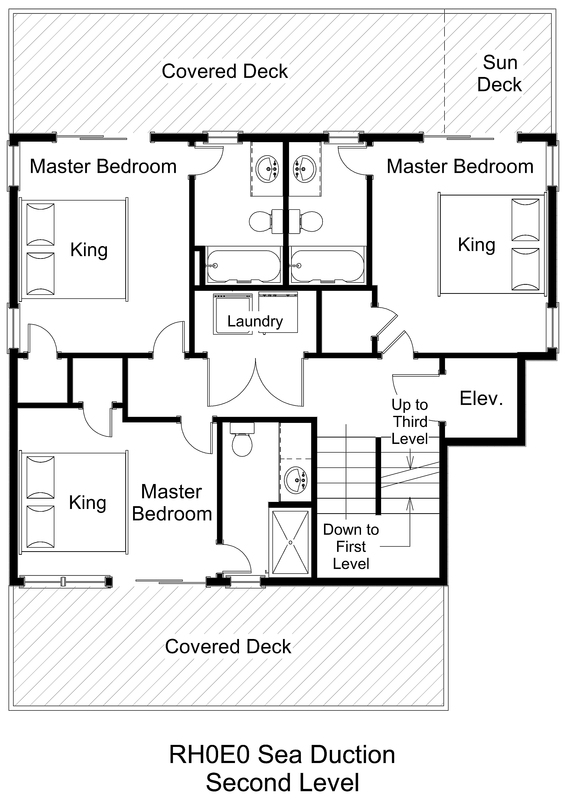 Three comfortable king master bedrooms are on the second level. Two open onto a shaded oceanfront deck, and the third opens onto a pool-view private shaded deck, the perfect place for some peace and quiet. The laundry area completes this level. 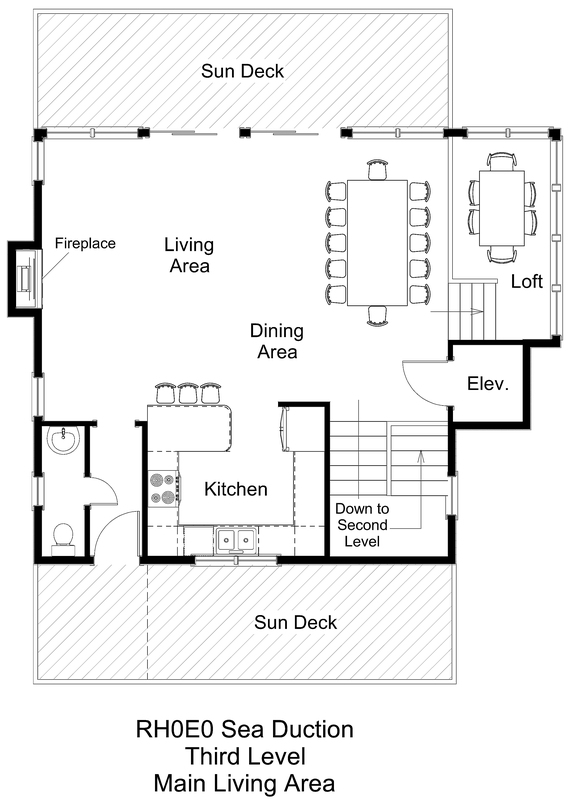 Family time can be anytime in the open living, dining, and kitchen area with breakfast bar on the upper level. Play a game of cards or just take in the view from the cozy loft overlooking the dining area, with views toward the nearby Rodanthe Fishing Pier. Curl up with a good book in front of the fireplace on cool winter evenings. Watch a beautiful sunrise from the oceanfront sundeck or soak up a stunning sunset from the sundeck down the hall from the living area. A half bathroom is also on this level. Soak up some sun in the private pool with free pool heat or get your toes in the sand via the semi-private beach boardwalk shared with just one other home. Spend your days splashing in the waves or casting a line right off the beach. Children and experienced anglers alike will love the complementary fishing pass to the Rodanthe Fishing Pier, included with your stay. Stroll or ride your bike to nearby dining and shopping for some local flavor. With easy access to any Hatteras Island adventure you could possibly wish for, Sea Duction is an enchanting choice for your next family getaway. For private planes there is the Billy Mitchell Airport in Frisco, or there is ORF in Norfolk, VA.
Is there a sleeper sofa in the loft? No, there is an additional dining table and chairs for board games and what not. It is currently shown in the 14th image on the reel if that is helpful at all. This home is everything you could want for a home this size. Perfect location. We have stayed on OBX since 1976. Have only rented the same house a couple of times over the 42 years because of the excitement of anticipating a new place. Thus house is in our top 5 and we may rent it again. Our stays have ranged from Corolla to Hatteras Landing. Have been in Rodanthe a few times and look to return again possibly as soon as next year because of the quality and location of this house (as long as a storm doesn't take it out since it seems quite vulnerable to the surf :)). If this home is ever available for a vacation that fits your time frame Don't pass it up Book It! This was my sixth year and Sea Duction is my absolute favorite! I booked it for next year! 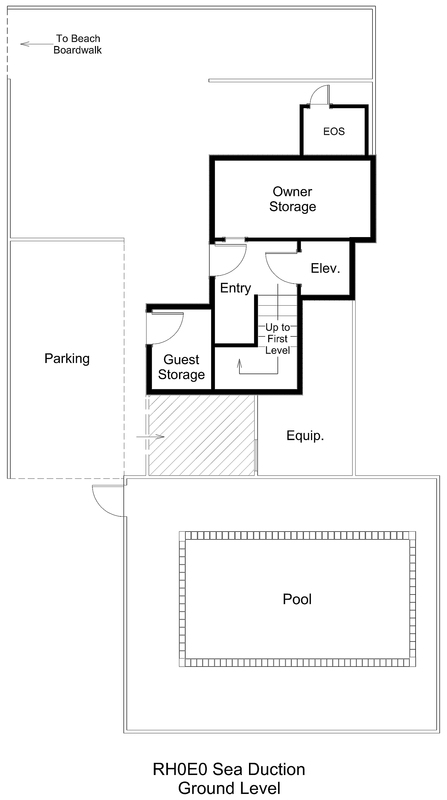 Terrific property perfectly outfitted to accommodate from the very young to aging seniors. Beautifully decorated. Kitchen well stocked with dishes and cookware and small appliances. Plenty of room and privacy for all. Sea Duction is beautiful! It is well-equipped and comfortable. The location is so convenient for families with small children to access the beach. It truly is an oceanfront home! We love staying at this home! The elevator is appreciated by our older family members who have trouble on the stairs. We love being able to view sunrises and sunsets without leaving the property. The easy and short walk down to the ocean then being able to rinse off and cool down in the pool can't be beat! The billiards table is a big hit and the full size refrigerator on the second floor makes life even easier for the week.